Why Do Children Get Leg Cramps At Night? 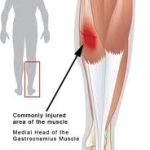 Night time cramps or ‘achy’ legs in children are especially common in the big calf muscles and even more specifically the inner section of the calf muscle known as the medial head of the gastrocnemius muscle, as shown in the diagram. This is almost always attributed by parents and family doctors to ‘growing pains’ with the accompanying assumption that it will pass in time – nothing you can do. This is not the case. Cramping calves in children are virtually always caused by a mechanical complaint – that is a problem with the pattern of movement of the foot and leg that leads to excess strain on the inner section of gastrocnemius muscle. 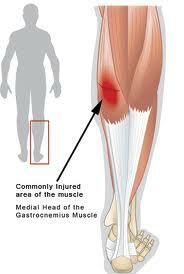 These cramps are terribly painful and easily stopped. If your child is suffering from night time cramps in any part of the leg or foot, book an appointment with a podiatrist to have your child assessed.